You know how we're an art family...: A new week. Inspired by and in honor of Michael Pollan's new book, Food Rules, I decided to take a week on my blog and show you a week's worth of meals at our house. Food Rules is what it says, a list of rules to help you eat a cleaner, more nourishing diet and gives you a better way to look at food than just a substance to fill your stomach. Much of the information in Pollan's new book is regurgitated from In Defense of Food, but in a clearer, more concise format. Mix dry ingredients in bowl then add wet ingredients. Stir until just mixed. 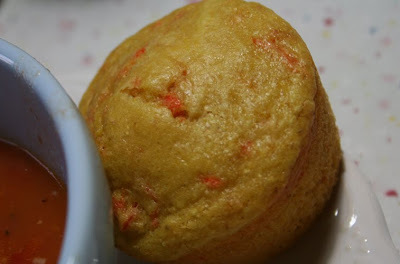 Pour 1/4 cup of batter into each muffin container. Bake at 350 for 18-20 min or until center of muffin is set. This looks like a perfect meal for the rainy day we're having today. 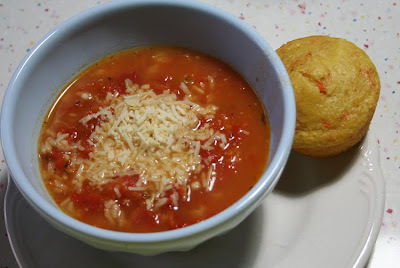 We'll probably have soup and muffins for dinner tonight. Thanks Joy! This is such a great idea...I may have to follow your idea here in the coming weeks. I love seeing what other's make for meals and it really helps me to come up with new ideas. Mmmm, looks like wonderful wintertime food. Interested to see how this week looks at your house! What a yummy, comforting winter meal. My first visit to your blog. Nice! Hope to come around again soon. I love your new banner Joy! This looks so great, I hope to try both recipes! I love the quote at the end of your post : ) From one vegetarian family to another I am really looking forward to your week of food! you totally beat me to it! But, we have been attempting to buy/cook local only. we were successful last night, i'll probably share later--but I warn you, it's meaty! joy, this is such a fabulous idea for a week's worth of posts. thank you!